One of the most overlooked aspects when preparing hydroponic nutrient solutions is the actual precision of the instruments used to measure the salt or liquid reagent additions. People who are not familiarized with the preparation of solutions usually underestimate the importance of this aspect of solution making - both concentrated and final - which is absolutely vital for the accurate and reliable preparation of solutions. On today's post I will attempt to explain the concept of instrument precision, the errors caused by this fact and how they are calculated by HydroBuddy to give us an idea of how dependent our calculations are upon our instruments. After reading this article you will be able to know if the instruments you are using for your solution preparation needs are adequate or what you need to do in order to ensure that the preparation of your solutions remains reasonably accurate. What is instrument precision ? This point is best illustrated by a practical example. Imagine that you are using a ruler to measure the length of a simple pencil. A common ruler (in metric units) generally has large divisions (in centimeters) and smaller divisions (in millimeters), when you measure the pencil you will note that the length of the pencil will be between two of the finest divisions - or very close to one - but you will not be able to determine the measurement beyond this accuracy. For example if the measurement of the pencil is between the 2.3cm and the 2.4 cm line you can say that the pencil measures 2.35 +/- 0.05cm this means that we can be absolutely sure that the pencil has a measurement between 2.3 and 2.4 cm but our instrument does not allow us to "see" any further. In this example the three digits of the measurement are called "significant figures" while the last one is called the "measure of uncertainty" since it is a value we can only be certain about within a certain threshold. When you measure your hydroponic solutions you need to use instruments to weight your salts or liquid fertilizers and you also need to measure the volume of your solutions (either concentrated or final). When you weight your salts your scale will have some uncertainty (usually represented as the point value of the last digit) so for example if your scale displays a weight for a salt of 5.50g the actual measurement is 5.50+/- 0.01g as - in analogy with the pencil example - the scale cannot determine the latest digit beyond a certain threshold. The problem with this is that if your salt's weight is in the vicinity of the scales last digit your uncertainty will be a big magnitude of what you want to weight. For example, if you want to weight 0.05g of a salt with the above scale the uncertainty of instrument will be +/- 0.01g so you will effectively have an instrumental error of +/- 20% of the salt's mass, meaning that your final concentration will probably be VERY deviated from what you intend to measure. Another important factor is the precision of your volume measuring gear since errors add up as you continue the preparation. If you can measure the volume of your reservoir with a precision of +/- 1L the you need to prepare at least 100L such that the error you get from the measurement of your nutrient solution's volume is not greater than 1%, however if you are preparing a concentrated nutrient solution (for 10L for example) you will need to use a more precise method of measuring volume, an instrument with a precision of at least +/- 0.1L. If you are uncertain of what the precision of your volume instruments are then you need to look at their graduation, the precision of a volume measuring instrument can usually be approximated to half its finest graduation. If you are measuring volume -for a concentrate solution for example - with a cup that has a line every 100mL then your precision is +/- 50mL (or +/- 0.05L). 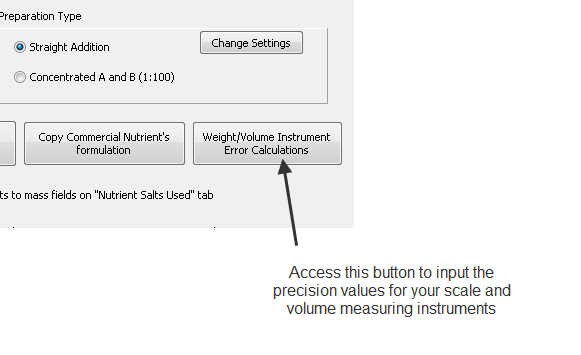 The above picture shows you where you can change the precision of the instruments used within HydroBuddy so that the program can calculate the error caused by your instruments in your preparation. Some people may have noted that when calculating "direct additions" there is no instrumental error while when calculating concentrated solutions there is, this is associated with the precision in volume since when straight additions are made the amount of volume that needs to be measured is MUCH higher while for concentrated solutions a much more precise volume instrument is required (depending on solution volume) since the volume is lower. If you get very large instrumental errors (for the calculations you are doing) then there are several things you can do to correct them. The first is to prepare large amounts of concentrated solutions since the amount of salts weight will be much larger. Preparing 20L of a concentrated solution with a 1:200 concentration factor will allow most people to weight their salts in a scale with a 0.01g precision while other solutions -such as using the direct addition methodology with concentrated micro and Fe solutions - are also possible. In the end you need to take very good care of instrumental errors and take them into account since they will determine the final accuracy of your nutrient solutions. 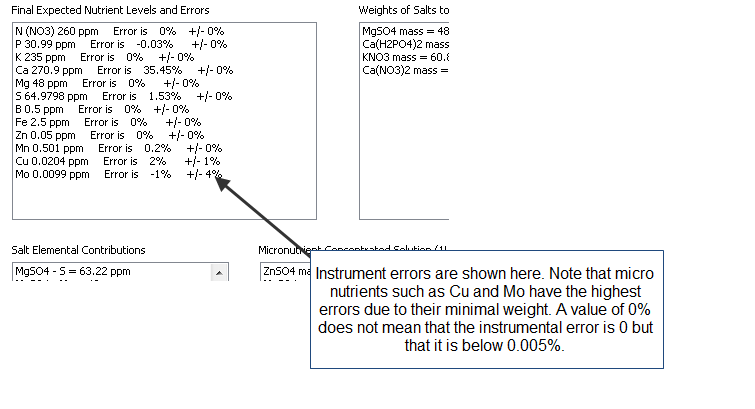 For macro nutrients the errors shouldn't be above 0.05% while for micro nutrients such as Mo and Cu, errors as high as 20% can be tolerated since higher precision would require the use of much higher purity salts since these elements are also possibly contained as impurities within other salts (meaning that salt purity becomes a higher factor than instrumental error below 20%). Nice article, calculating the error margins certainly was one of the banes in my quantitative analysis course. But i would like to ask one question about it: Why 0.05%? It looks too specific to be a rough guideline. It is so low, that i am tempted to ask, what will happen at 0.06% (of course, only being half serious, but i guess you get the point). I once read that plants have quit a big plateau in their nutrient concentration vs plant yield graphs. My aquarium plants certainly dont mind different nutrient concentrations, as they have to live with what the fish can survive in good health, which is alot lower than your typical hydroponic nutrient concentration, for example approx 30ppm K and N.
The problem with measuring to such a degree of precision is that you're essentially doing all the work on a group project, and all the other people in the group are working against you. Your measurements can't take into account the significantly larger variances in the purity of the compounds that you are using to make your solution, as well as their varying degrees of hydration, since almost all fertilizer salts are hygroscopic to some degree, and purity measurements generally don't take the consequences of this factor into account. That being said, as long as the salts and solutions that you use are from the same container, which is kept tightly closed, the amounts of each ion you add won't vary considerably. Precision won't ultimately be affected, but accuracy will still be victim to systematic errors from salt purity issues. But the amount of each ion that your plants are exposed to will still change beyond a 0.05% tolerance. Differences in humidity that are difficult to account for will cause plants to uptake nutrients to a varying degree, quickly changing the composition of your nutrient solution as time goes on. This will occur to a varying degree from one refill to the next. All this being said, I hugely respect your dedication to precision. I am an extremely fastidious chemist who has been yelled at by my boss for being too detail oriented. I recrystallize the salts I use in my hydroponics <i>hobby</i> and dry them in the oven. Except calcium nitrate, which would fuse at the temperatures I would need to dry the hydrate, and I don't want to deal with that. Call me lazy, but omitting just this one step kills my shot at 0.05% tolerances, and even ACS grade calcium nitrate contains Mg, Fe, and Co. I would rather enjoy hydroponics than have it become a burden. Even though I disagree with you here, I still think your blog is the best. If there were hydroponics teams and I was the captain of one of them, I would pick you first. My plants would undoubtedly thank you too if they could. Thanks for the answer :) Keep on with your website, its a treasure chest for people like me who are just starting with the hobby and definitely a notch above the other ressources out there. Hi Daniel. I had some question for you, would you mind contacting me privately on my email? I left it in the login, its christian.dior ___at___ gmail dot com. thanks! how do we get this free ebook? The program default only has phosphoric acid listed at 30%. I have 85% phosphoric acid. How do I add this into the software correctly? The density of my 85% phosphoric acid on the msds states 1.685g/ml. Please help! I'm confused because the 30% H3P04 is set to 52 for purity and 1.5g/ml. I just need to know which numbers to set the 85% H3P04 at. Thanks for your help Daniel! I just donated to you bro, love the software by the way. It's genius....It's a very well made program! plz can u answer how hogland choose ppm of evry element and depend in what?